Boulder Falls, as we saw it on June 25, 2018. Lots of water in it then, and it was great to finally see it again! June 25, 2018 update: well, we went up to Boulder Falls, and as expected, it was a pretty busy place. We arrived there around mid morning, and weren't sure if we would find a parking spot. Luckily we did, but it was one of the last spots, or maybe it was the last spot. Anyway, as I like to say, the earlier you can get there, the better :-). The first thing I noticed at the entrance to the falls was a new sign which among other things, emphasized that visitors must stay on the trail, and that climbing is not allowed. It turned out that they put this sign up in several other places along the trail too. Stay safe :-). Other than this sign, the only other thing I noticed was that the rocks on the left side of the trail shortly before the viewing area for the falls, were held back with some type of wire to keep them from falling onto the trail. Otherwise, everything else about the trail looked the same as far as I could tell. So, if you'd like to see Boulder Falls again, (or if you've never seen it), it's ready and waiting to be seen, after five long years of being closed! June 12 2018 update: OK, guess what?!! I just checked, and after five long years, Boulder Falls has finally re-opened! One of our local TV channels reported this, and said it was going to open on June 8th, which was last Friday. I will try to get up there soon, and when I do, I will report back. I'm expecting it to be pretty busy! If you get there before I do, feel free to report back in the comments at the bottom of this page :-). Boulder Falls is a pounding waterfall near the outdoorsy town of Boulder that has sometimes been called the “Yosemite of Boulder Canyon”. It’s definitely worth your time, especially in early summer. That’s when the waters of North Boulder Creek swell, thanks to the spring snow melt. If you like to feel the spray coming off a waterfall, this is one such waterfall. In fact, if you’re taking a picture, you may want to step back a few feet, in order to protect your camera. 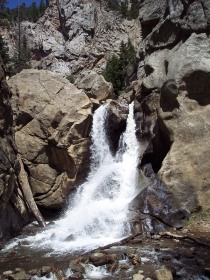 This Colorado waterfall has some history in its past too. There’s a sign at the entrance to the falls that tells you all about it. But briefly: it was threatened by mining in 1908 by a tungsten mining company that wanted to dig a tunnel there. Then in 1914, Charles G. Buckingham donated the falls and five acres surrounding it, to the city of Boulder, where it’s been safe ever since. It’s a pretty busy spot these days and unless you get there early, you’ll likely have company. The water from this Boulder waterfall tumbles for approximately 70 feet into Middle Boulder Creek, where it then meanders its way downstream. There’s a viewing area straight in front of the falls, as well as a short path that follows alongside the creek. So, if you’re ready to go, here’s how to get there: from Boulder, follow Canyon Blvd. (Hwy. 119) west through Boulder Canyon for approximately 11 miles. 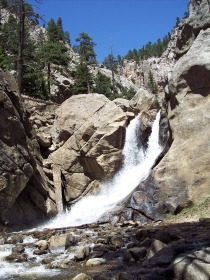 The falls is between the towns of Boulder and Nederland and there’s also a prominent sign saying “Boulder Falls”. Look for it on the right side of the road, but don’t miss the parking area, which is on the left side of the road, across from the entrance to the falls. In case you’re wondering if there’s a fee to see this waterfall, there isn’t-it’s free. Another nice thing about it is that leashed dogs are allowed here. 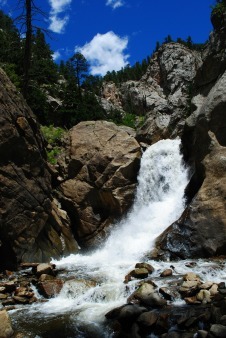 So feel free to bring your furry friend for the short and fairly easy hike to this great Colorado waterfall. One other thing you need to know is that the trail to this waterfall is only open from May 1 through October 31. Those are the best months to see it, and of course, the earlier in the season, the better :-). A note of caution: the area just beyond the viewpoint has been closed because the rocks and water are more dangerous than they look. People have been injured and even killed as they scrambled around the falls, so please be careful. Anyway, have fun visiting Boulder Falls, and if you want to see it at its best, be sure to go between late spring to early summer, when the volume of water will be greater. Return from Boulder Falls to the Boulder Colorado page.